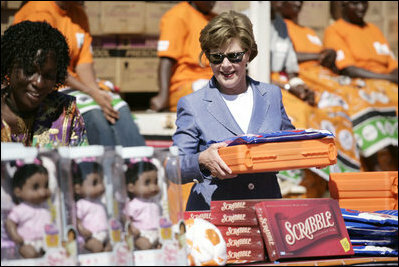 Mrs. Laura Bush assembles a home care kit at the Mututa Memorial Center Thursday, June 28, 2007, in Lusaka, Zambia. The center provides many humanitarian services including home-based care for people living with HIV/AIDS, care for orphans and promotes abstinence and faith for youth. It serves more than 150 individuals with a core of 36 trained caregivers.